Pike fishing has always been a passion of mine and early spring is one of the best times to catch these fish. Spring finds these fish thick in shallow water and can be caught by both casting and trolling. Spinners and spoons are go to’s for these fish however swim baits and crank baits are also effective. 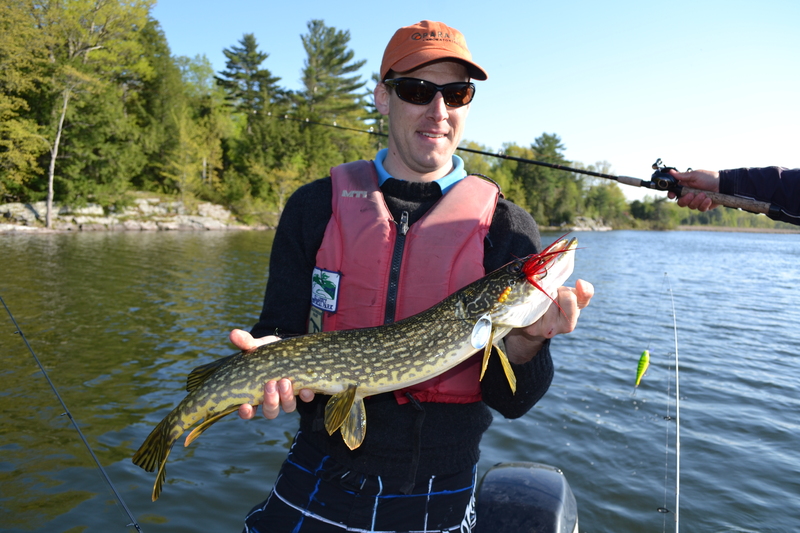 Lucky for us Ontarians (especially in the kingston area) we have many Eutrophic lakes that are absolutely teaming with Pike. Two of my work mates and I left work early on May 14, 2013 and headed to our favourite local Pike spot, Collins Lake. 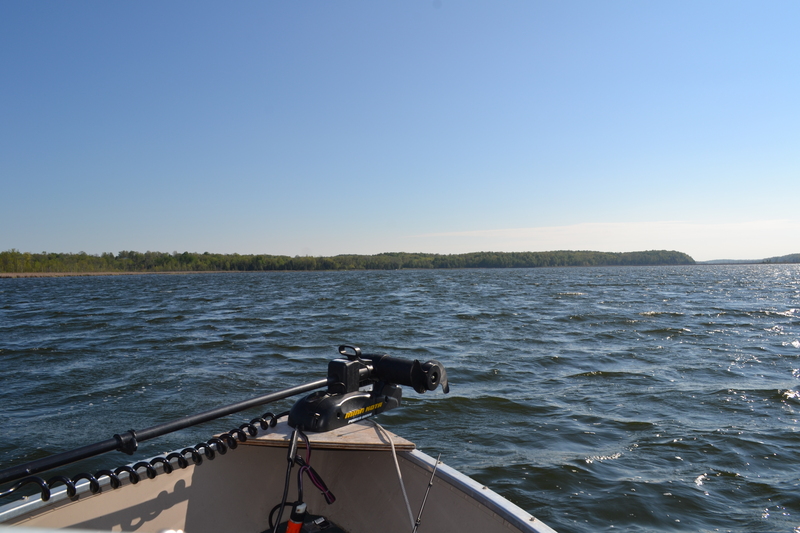 The water was a bit choppy with a 15 km/hr SW wind that ran right through the large fetch on the lake so we were limited to trolling at the beginnning of the outing. We immediately hooked into a decent 1-2 lber and then hit a lull. Ever persistent when using techniques I have alot of confidence in, we kept trolling and the fishing slowly picked up. By about 6pm we were getting into decent pike on a pretty regular basis. When the action died down on the trolling we decided to switch up and throw some spinner baits into the shallows. Sure enough, the switch in gear paid off. The action once again heated up and our numbers swelled to around 30 fish with at least one double header ( two or three if you are using Tarpon rules and leader touches count!). All in all, a good first kick at the pike can in 2013. 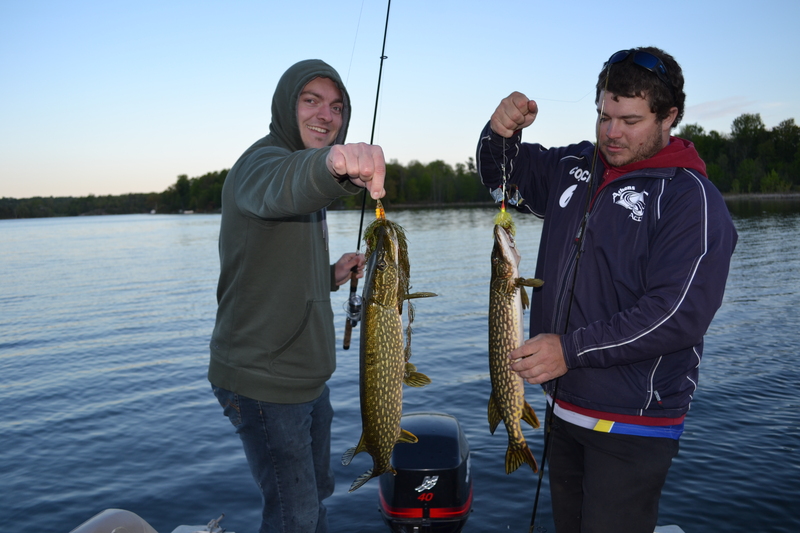 This entry was posted in Fishing and tagged Collins Lake, Fishing, Kingston, On, Outdoor Activities, Outdoors, Pike, Pike Fishing, snot rockets. Bookmark the permalink. ← Harvesting Dandelions – Syrup! Very nice! We haven’t gotten out fishing in my neck of the woods, and it opened up on the 4th. My goal this year is to catch a pike and a muskie. Hopefully I catch half as many as you three. Good luck! Catching a musky is a special experience and pike are just plain fun! Nice! They are in there for sure. Had one chase a crank bait during a bass tourney this year.